Members of Estrella Tropical prepare to open the Puerto Rican flag at the Festival Tetances Parade, part of the Festival Betances. Named after Ramón Emeterio Betances, a Puerto Rican patriot whose medical contributions benefited Latin America, Festival Betances celebrates its 50th anniversary this year. Aaron Kline celebrates a win with Jason Cook as they gamble for a pool of cigarettes at SEPTA Correctional Facility in Nelsonville, Ohio. Chris Streeter, far left, ended up winning the pool of cigarettes, a total of 11 packs, and plans to use them to trade for a “pick and poke” (tattoo). Joe and his family quad across a hay field in search of moose. Joe grew up on the Sucker Creek Reserve in Alberta and killed his first moose when he was 11. 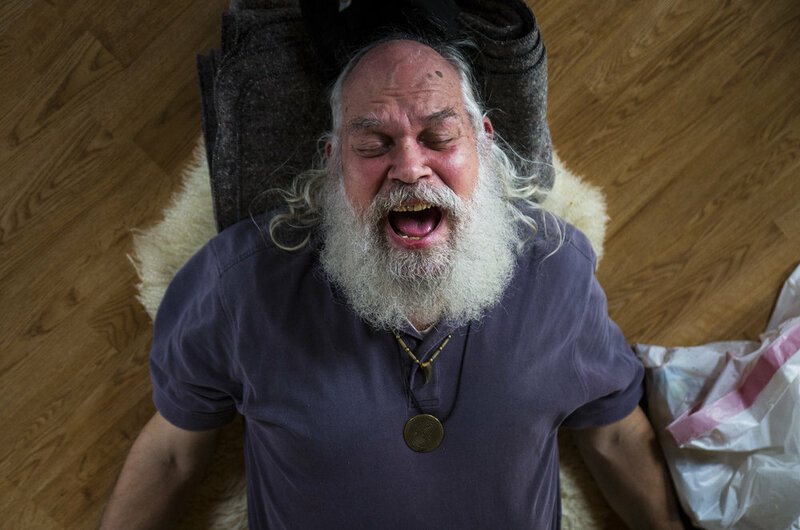 Jim Wert journeys during a Shamanistic ritual performed by Reverend Kate Rodger at Blueberry Gardens in Ashton, Maryland. Majorette performers from dance group Area 51 hang out before performing in Boston's Trinidad Style Carnival, which celebrate's the Caribbean community with costumes, floats and lots of dancing. Nova Holland, left, and her sister Hana of Los Angeles, CA celebrate the fourth of July on Children’s Beach at the Chautauqua Institution in Chautauqua, NY. Charlie Groom throws shadows on a sheet while playing with his cousins Owen, Leo and Colin (left to right). Russell Willier, a Cree medicine man, rests in the back of his van after cutting plants to make Thunder Medicine. "If this doesn't work, I have four months left," he said. Russell is battling cancer that started in his bladder, but has spread throughout other parts of his body. After doctoring himself through his initial fight with bladder cancer, Russell is now seeking westernized treatments alongside his medicine, but refuses to use radiation or chemotherapy. Valencia! applies her eyelashes before performing at the Museum of Science. Valencia!, who has been performing for almost 10 years changes up her look often, but described the night's theme as "high horse, spooky drag". Boston's best Drag Queens took over the Planetarium for the first time to kick off the museum's Summer Thursday programs. People celebrate in the confetti during the Boston Pops Fireworks Spectacular. Despite the heat; "a large crowd came out to celebrate one of the country’s largest and oldest public Fourth-of-July events that took place on the Esplanade. Pristine Christine walks past the sun exhibit before she performs at the Museum of Science. Boston's best Drag Queens took over the Planetarium for the first time to kick off the museum's Summer Thursday programs. Labor advocate Jeff Ballinger hands out balloons to people at the Lowell Southeast Asian Water Festival. Ballinger is one of 10 democratic candidates running to represent the people of Massachusetts’ 3rd District in U.S. Congress. Ruth Weiner and Judy Lipsky push through on day two of a three-day journey, covering hundreds of miles, on Martha's Vineyard. Ruth and Judy met in a mom playgroup in the 70s, found they shared a love of bicycling, and now, in their 70s, the two have cycled 1000s of miles together, all over the world. Greater New Bedford High School teammates celebrate after winning the State finals at Worcester State. Greater New Bedford played Leicester High school and won the game 5 - 1. Jennifer Wilson hangs up laundry with her 7-year-old daughter, Sawyer, in their backyard. Due to the effects of the National Grid lockout, Jennifer and Sawyer have been without gas for four weeks. Sophie paints on a canvas at the Hole in the Wall Gang Camp. Created by Paul Newman in 1988, Hole in the Wall Gang Camp is dedicated to providing a week long camp experience to seriously ill children and their families. Kathy Federico and Alessandro, 7-years-old, send money down from their window as an offering to Madonna del Soccorso (Our Lady of Help) during the Grand procession of la Madonna. The procession took place over several hours and marched through the streets of the North End. Micah Johnson, center, a fourth year medical student at Harvard University, participates with other Demonstrators in a "die-in" in the center of the Harvard Art Museum's atrium during a rally lead by Photographer Nan Goldin. The demonstration was held at the Harvard Art Museums to protest the benefactor of the Sackler Art Museum, who was a founder of a pharmaceutical company that has made vast profits selling opioids. Parkway Falcon's coach Bob Kilduff has the team do push ups as The Boston Fire Department hoses them off after they practiced in above 90 degree heat. 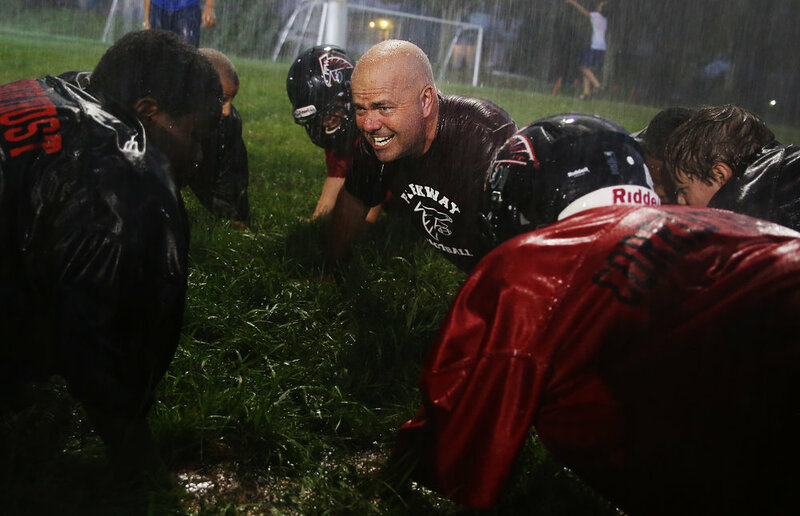 This is a tradition that has occurred for years in West Roxbury for the young Pop Warner football players during their summer practices when temperatures rise. Gennie Garcia, right, kisses her daughter Getzaynie, 4-years-old, while they spend time in their friend's apartment. Gennie was illegally subletting from a friend after moving from Puerto Rica after Hurricane Maria. The landlord has demanded she be out by July 1. She didn't qualify for FEMA's TSA program due to a miscommunication about her family's home on the island. Today she's working to figure out where she's going to go next. College Bound Dorchester students wait to walk in for their ceremony where they will accept their HiSet certificates in pursuit of their college degrees. The nonprofit is paying formerly gang involved youth a weekly stipend to pursue college degrees in addition to giving them peer based social emotional and educational support. Congressional candidate Leonard Golder, left, stands with his campaign manager Ellen Wendruff while greeting voters at the Market Basket Supermarket. Golder is one of 10 democratic candidates running to represent the 3rd Congressional District of Massachusetts. Dylan Mann chases after his 14-month-old stepson Jason while they visit the grave of Dylan's niece, Jasmine. Jasmine was 2-years-old when she was killed by her mother, Tami Mann. Jasmine was killed in September of 2015 and this is the first time that Dylan has visited her grave.